If you haven’t notice this yet, you might want to search and know more about it. Every October, artists all over the world draw and create art using ink. Some have their personal reasons in creating ink art in October while some are drawn in the idea of improving their skills (even only for 31 days). InkTober is a parallel to the yearly Octoberfest, not with beer but with ink. According to Jake Parker of inktober.com, everyone can pick up a pen and draw. Drawing in ink does not need the complexity of painting, just pure drawing. Each day in the challenge also encourages the participants to follow a theme (although some can do it without a prompt) which forces them to think and use their emotions in creating an art. The rules are very simple: All you have to do is to draw in ink, post it online, and use the #inktober #inktober2016. Are you up to the challenge? 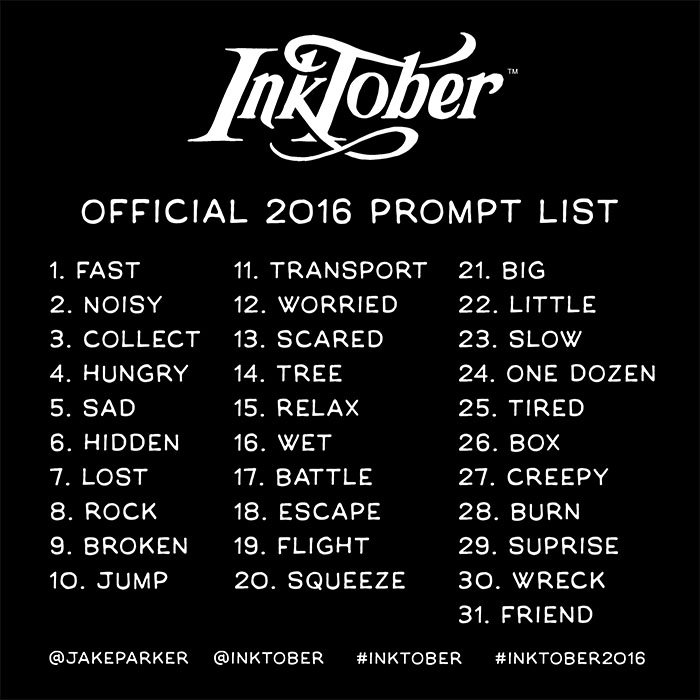 Learn more at inktober.com and show us what you can do. Posted in Education, Events and tagged art, event, inktober, inktober2016. Do you wish to read some more?